"I always site [sic] at the end of every paragraph." (In response to a written survey on career goals) "I want to be a writter [sic]." ALIENS HAVE LANDED ON THIS EARTH! RUN AWAY AND HIDE, BECAUSE THEY LOVE BRAINS! I FORGOT SOMETHING VERY, VERY, IMPORTANT!!!!! NEED TO HIDE! tHEY EAT BRAINS! SO YOUR SAFE! Look, we're not going to confirm or deny the absence of a brain in our skulls. We assume, though, that someone who doesn't know the difference between "you're" and "your," and someone who leaves the apostrophe out of "don't" will also be safe in the event of a zombie invasion. Also, "this Earth"? Is there another one out there? And if so, can we please reserve some beachfront real estate? The endless winter in Seattle is killing us. Oh what a hideous ad. It's not just the background, which is the exact color of the mysterious substance newborns leave in their diapers. It's not just that this man has a badly knotted tie. It's that he's thinking about..."less taxes." Was he schooled in a barn? It's "less tax" and "fewer taxes." "Tax" is something you can't divide into individual units. When you're describing a thing that can't be counted individually, such as "tax" or "money," use less. When you're talking "taxes" or something that can be counted (hours, days, cans of soup, dollars), use fewer. Thanks to Matthew K. for the photo. Perhaps they're researching the effect of misspelled signs on drivers. Josh sends this in, saying it explains why fire trucks cost so much. Ontario — Ontario Fire & Rescue added a new tool to help with medical emergencies last month. The vehicle, dubbed “Rescue One,” cost $226,782 and was purchased last month with money set aside in the 2007 to 2009 Ontario budget. The word Katie Pizza (great name) meant to use was winch, which is basically a big pulley. A "wench" used to refer to a girl or servant, then by the 1300s was meant to imply something altogether naughty and insulting. If you really want to insult someone and you happen to have traveled back in time, call her a "wench of the stews." Zing! SPOGG also objects to the headline. "Garner" means to store, collect, accumulate, or earn/win through effort. Perhaps the headline writer was looking for a fancy alternative to "gets" or "buys"; this attempt goes clunk. Writer and editor Louise Julig celebrated National Grammar Day by explaining how she managed to avoid a phishing scheme that pretended to be iTunes. The point, of course, is that spammers often use bad grammar. It can be a useful rip-off tip-off. 1. MY beauty. My body is just as beautiful as My face; wait and see! 2. MY intellect. I actually has brains to match MY beauty. 3. Location! Location! Location! available rite now, I offers convenient incall as well. 4. I'm 100 percent independent. 5. The pictures are real, what you see is what you get. There is no bait and switch here! We received so many posts from people describing their National Grammar Day celebrations that it will take us a while to share them all. Thanks for all the thought and effort. Stay tuned for amusement! Meanwhile, Jessica found this headline. Perhaps it means we should all ready ourselves for the coming zombie apocalypse. SAN FRANCISCO – Investigators on Thursday were trying to figure out how a murder suspect sneaked a 6-inch metal spike into the Stockton courtroom where he attacked a judge with the handcrafted weapon before a detective shot him [not the judge, we hope] to death. A ninth grader once wrote this sentence: Juliet's last wish was to get laid in a beautiful tomb. But What Did He Lay? So it's come to this. When teenagers listen to their parents, it's considered news, just as "MAN BITES DOG" will generate headlines. Still, this story leaves us with more questions than answers. BANGOR TOWNSHIP, Mich. -- A father's decision to tell his 17-year-old son to get off the floor and lay down on a couch may have saved the boy from injury when a suspected drunken driver crashed into their Michigan home. Roy Rabadue told The Saginaw News and WJRT-TV he was watching television Monday night in their home in Bay County's Bangor Township, about 90 miles northwest of Detroit, when he decided to make cookies. He told Joseph to move, and his son complied. Shortly afterward, a pickup smashed into the home. The crash tossed their 52-inch television across the living room, landing where Joseph had been on the floor. The couch overturned along with a chair where Rabadue's 12-year-old son, Jacob, was sitting. Both escaped injury. WNEM-TV reported the driver was arrested. What puzzles us, though, is the information that's been left out. The father was baking cookies. He told his son to "lay" on the couch, so clearly he needed eggs. Did the son actually produce? Now that would be news worth reading. The Gotham Writers' Workshop is giving away a copy of Things That Make Us [Sic], SPOGG's very own guide to grammar. If you're feelin' lucky, why not enter? Who knew that March was such a big month for word nerds? In addition to National Grammar Day (which was yesterday), we have World Book Day (today); wrapping both events in a big alphabetical hug is Words Matter Week, a production of the National Association of Independent Writers and Editors. SPOGG will be chatting with NAIWE (and perhaps advising them on the art of acronyms and initialisms) today at 3:30 EST. To warm things up, we're posting a bit we wrote in January for Grammar Girl that felt like a good salute to the occasion. Does it bother you when someone says, "Between you and I"? Does your lip twitch ever so slightly when someone uses an apostrophe to make a plural? And does a teeny-tiny part of your soul shrivel when Neil Diamond sings, "song she sang to me, song she brang to me"? If that's the case, you are not alone--even if sometimes feels that way. Every day, people like us see and hear errors that needn't be made: in pop songs and movie titles, in television newscasts and movie dialogues. It's an ongoing assault to the senses, and let's face it--it can feel pretty darned depressing to those of us who care about language, who love it, and who try to use it as well as we can. Try not to lose heart, though. While it might be stylish in certain quarters to ignore the rules of standard usage, grammar matters elsewhere. managers, 75 percent said it was worse for an applicant to have a spelling or grammar error on his application than for him to show up late or—get this—swear during an interview. Holy bleep! It continues to matter when you've landed that job. Remember the fictional TV lawyer Ed? He lost his job in a Manhattan law firm because of a misplaced comma in a contract. Just in case you think this sort of thing only happens on TV, think again. A utility company in Canada had to pay an extra $2.13 million in 2006 to lease power poles because someone stuck a comma in the wrong spot. It matters even if you have an illegal job. A bank robber once got nabbed, in part, because he spelled "money" M-U-N-Y. The bank teller realized the man was such an idiot, he could be tricked into robbing the bank across the street—where police summoned by the teller were waiting. And get this: A woman who killed her husband and then wrote notes to the police was caught in part because of her tendency to misuse dashes and quotation marks. All police had to do was compare her regular correspondence to the anonymous taunts sent to the police and they had a powerful piece of evidence against her. Grammar also matters if you're looking for love. Raise your hand if you'd want to go out with someone whose personal ad contains spelling and grammar errors. That's right. It's a turnoff. It's the equivalent of having spinach in your teeth, or having the zipper on your jeans undone. Speaking of jeans, grammar and clothing have a lot in common. Let's say you see a man in a Speedo. Are you at the beach? Let's hope so. If he's wearing a Speedo on public transportation, the man's probably a lunatic. At the very least, you don't want to sit next to him on the bus. In just the same way, using the wrong kind of language in the wrong place can send some pretty nutty messages. Let's say you sent your company president e-mail and you used the number 2 as shorthand for "to." Essentially, you're saying, "I don't need that raise this year after all. In fact, I might not really even need this job." That doesn't mean you can never use shortcuts like this. Even though people who love grammar are less likely to do so, it's fine to save your thumbs when you're texting. It's all about context. You don't wear a Speedo or other super-abbreviated forms of pants on the bus. Likewise, you don’t use really abbreviated language where it doesn't belong. Of course, you know this already, you with your pants carefully zipped, you with your shirt covering your navel. You know that being grammatical isn't just about following the rules like some sort of robot. It's about paying attention to context. It's using language that's most likely to be understood. It's about sending a message that will be met with respect, just as it shows respect. So thank you for caring—and good luck out there. Richard Nordquist is your guide to all things grammatical on About.com. He's a professor and the author of several guides for writers. A Way with Words This public radio show, featuring Martha Barnette and Grant Barrett, is a treat for people who love language--and have a grammar pet peeve or two. What happens when English becomes the language of the global business world? The polyglot Casey Butterfield, an editor, writes about the various things that can get lost in translation. Bill Walsh is a copy editor at the Washington Post. He's also the author of Lapsing into a Comma and The Elephants of Style, two books every word lover must own. His main site is called The Slot. Editor and freelance writer Lauren Holder has a blog full of useful information and resources for editors—and people who need one. For people who like a bit of glamour with their grammar. Learn how not to speak from the sharp-eyed Dana, who keeps this blog. This arresting blog is for all law-abiding language lovers. Journalism instructor Doug Fisher has a wonderful blog for journalists and people interested in the media; he also offers up nuggets about style that serious writers will enjoy. This hilarious blog is for "editors, editors at heart, and anyone else who thinks grammar is hot." We approve. Gabrielle is a freelance editor, and her blog is full of useful information, advice and resources for writers, editors and freelancers. Karen Reddick is the author of Grammar Done Right and this companion blog, which offers clear, common-sense grammar tips that are easy to understand. John Sturtevant's "Say What? Start Making Sense"
Sturtevant, an expert on clear writing, runs The Writing Workshop, which offers training in effective business writing. Here's proof that good grammar is a family-friendly pursuit. This blog is fierce. It recommends stringing offender's (oops—offenders) by their gonads. It's all in good fun, though. Oprah's favorite grammarian answers questions in a clear and lively way, and offers a popular podcast as well as an e-book and forthcoming printed guide. The copy desk at the Wichita Eagle wants to prevent you from slipping on the various banana peels of language. Patricia Harrelson and Keiti Pierce are the grammar police, and while they won't actually arrest you, you will find their blog to be an arresting blend of humor and education. Just don't send them...emails. That word is a pet peeve over at the cop shop. Aspiring journalists can get news and tips for better writing and editing at this site, managed by journalism professor and author James Glen Stovall. This blog, developed by a professional writer and editor, is a treasure trove of amusing errors. Lisa Pampuch, a journalist in Santa Clara County, writes about current events, language, and other interesting things on her blog. A professional writer and editor keeps this blog, where she expresses her love of grammar, punctuation, and correct word use. National Grammar Day is smack in the middle of Words Matter Week, which features teleseminars, book giveaways, and discussions about the way words affect us. Learn how journalists write at Newsroom 101, which has more than 1,650 free exercises in Associated Press Style, which governs most newspapers. A writer and budding novelist blogs about grammar. Pam Nelson will celebrate her birthday on National Grammar Day, so we are pleased to feature her online grammar class, which she gives at the Web site of the News & Observer, a North Carolina newspaper. The several hundred thousand members of her Facebook Group (I Judge You When You Use Poor Grammar) can't be wrong. For word geeks and journalism junkies, this blog by journalism professor Ted Pease offers a delightful word of the day culled from the pages of newspapers and magazines. Andy Bechtel teaches writing and journalism at UNC-Chapel Hill. He's especially interested in the meaning of words, and how they can be most ethically used in news reporting. Jeffrey Hill is an English teacher in France. This is his blog, meant to assist students learning English as a second language. Two intrepid word lovers have declared war on errors. United by blood and a love of grammar, this pair of sisters blogs about language and grammar using examples of real-world errors. Pam Robinson examines language issues with language and the media. Writing Forward is a fun, supportive blog where writers can gather to get creative writing tips and ideas. Featured topics include fiction and poetry writing, grammar, and literary news. The site also features writing exercises and prompts to provide writers with new challenges and inspiration. John McIntyre keeps this blog at the Baltimore Sun, where he works as assistant managing editor. He focuses on grammar in print, and officially doesn't care about misspellings and other errors in e-mail, speech, or on restaurant menus. Write to him without fear! 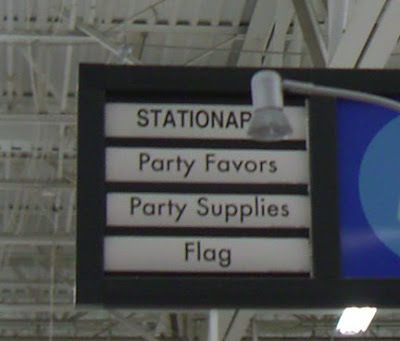 On this National Grammar Day Eve, when the country is watching the stock market collapse and jobs evaporate in startling numbers, we look to none other than Wal-Mart for comfort, because they're selling "stationary" right next to the party supplies. Now if only we knew where the stationery was...we'd really like to send a thank-you note. *Yes, we know it looks like "Stationap." This is not a word. And while we would pay money for a nap (preferably not at a station of any sort), it's not something that Wal-Mart is selling. Not yet, anyway. Fast forward six weeks later to the After the Rose special, and Mesnick admits that the "chemistry is completely different," with he and Rycroft [we'd use a comma here, too] and [he] dumps her. Then, he asks initial reject Malaney out [we'd put the "out" after the "at"] and she accepts. At a minimum, this should read "with him and Rycroft." Is this just our own pet peeve, or does anyone else hate it when the term "chemistry" appears in connection with romance? We studied chemistry in high school. It was completely unromantic, often smelly, and occasionally led to fingertip burns. Let's come up with a new cliche after National Grammar Day, okay? And Karen, you should never be embarrassed about enjoying pop culture. It's such a delicious diversion--and even more, a rich source of bad grammar for those of us who track such things. ... in which John McIntyre solves a crime and sends us to...well, you're just going to have to read it to find out. One of them is Richard Nordquist, who is the grammar and composition guide at About.com. On his blog he asks which kind of grammar you will celebrate on Wednesday (National Grammar Day! Wuhoo!). At SPOGG, we're not picky. If you're thinking about language and debating where you fall on the prescriptive/descriptive scale, we're happy. Now go read what Richard has to say.